Vinton came to prominence with his shorts Closed Mondays (for which he won the Academy Award for Best Short Film, Animated in 1975) and Rip Van Winkle, both beautifully rendered in the director’s distinctive Claymation style. On the basis of these funny and idiosyncratic works, his Will Vinton Studios became an in-demand producer of advertisements, ultimately resulting in his most famous creation: the California Raisins band. Along with Domino’s The Noid (another Vinton creation), the astoundingly popular clay Raisins inspired a merchandising bonanza – including their own television series – and quickly became symbols of 1980s America. 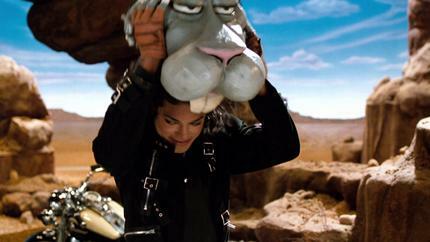 Vinton was also a key collaborator of such luminaries as Eddie Murphy (The PJs) and Michael Jackson, with whom he worked on several projects. It was Prop Store’s great honor to offer Jackson’s surreal rabbit-headed costume from the “Speed Demon” segment of the Moonwalker anthology, which Vinton directed, to collectors during our Live Auction 2018. Perhaps Vinton’s most important contribution to entertainment was as a beloved public personality in Portland, Oregon, where he moved his Will Vinton Studios in 1978. The move helped to cement Vinton as one of the region’s most significant industry advocates, helping to lure producers and studios to a city now known as the headquarters for animation house Laika and as the home of The Simpsons’ Matt Groening, filmmaker Gus Van Sant, and Portlandia creator Carrie Brownstein. With his many accomplishments, a uniquely resonant style of animation, and his trademark joie de vivre, Will Vinton embodied a creative genius unlike any other in the world of entertainment. The humor and intellect behind his clay creations will live on in cinema, TV, and beyond.